Ant-Man and the Wasp is getting ready to start filming this summer, but Marvel fans won't have to wait that long to see more adventures with Scott Lang. Disney XD will be running a series of animated shorts featuring the sometimes tiny Avengers this summer, which should help tide fans over until the Ant-Man sequel arrives next year. The series of shorts, officially titled Marvel's Ant-Man, will arrive on the network this June. The new series of Ant-Man shorts was announced by Entertainment Weekly and, in addition to the announcement, they also previewed a first look at Marvel's Ant-Man via a few quite colorful images. 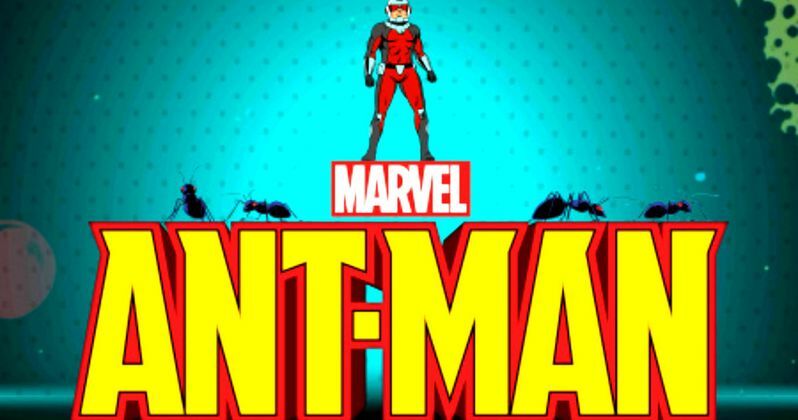 The first is the poster for the series, which features the titular hero standing on top of the Marvel's Ant-Man logo, surrounding by a handful of his tiny insect friends. Here's how EW is describing the new animated shorts, which will feature Josh Keaton as the voice of Scott Lang. "Voiced by Josh Keaton, the shrinking hero will fight evil alongside the Wasp and Hank Pym. He'll score occasional breaks to help daughter Cassie with her homework." The other two images that EW released were actual from the series, and they look to be very much inspired by the 60s and 70s comics, with a more hand drawn look, as opposed to a CG animation style. The first image from the Ant-Man series sees Scott Lang walking around in a kid's science fair project, which is a model of the solar system. The second features the hero duking it out with Yellowjacket, who was the main villain in the 2015 Ant-Man movie. Looking at these stills, it's a little hard to believe that they are coming from an animated series and not a new comic book from Marvel, which should give the shorts a cool look. EW also revealed the titles of the shorts, which will be Alien Invasion, Soup Time, Science Fair, Exterminator, Proton Cube and Not a Date. Ant-Man did well when it hit theaters, grossing $519 million worldwide, which is pretty good for a weird character that not a lot of casual fans knew much about. But having Scott Lang show up in Captain America: Civil War definitely helped with his popularity, so doing these shorts on Disney XD seems like the right thing to do. Especially as Marvel tries to build hype heading into Ant-Man 2 next year, which is due out on July 6, 2018, just a couple of months after Avengers: Infinity War. Disney XD has played host to a similar series of Marvel shorts before, which starred Rocket and Groot from Guardians of the Galaxy. So it looks like this could become a more regular thing. The six two-minute Ant-Man shorts in this series were directed by Ugo Bienvenu and Kevin Manach and written by Brian Wysol. You can catch Marvel's Ant-Man on Disney XD this summer on June 10 and 11. For now, you can check out the first images from the series for yourself below.